I am reading Marcus Samuelsson’s memoir, “Yes, Chef.” I checked it out of the library’s ebook collection because I have seen the author as a judge on cooking competition shows like “Top Chef” and “Chopped” and I like books about chefs and restaurants. Marcus Samuelsson was born in Ethipia, and the first chapter of the book, “My African Mother,” is an essay about his birth mother. When she and her children all fell ill with tuberculosis, she walked many miles from her remote village with two year old Marcus on her back and his five year old sister by her side to reach a hospital in Addis Ababa. She died there, but her children recovered and were eventually sent to Sweden to be adopted by the Samuelsson family. Today, in the dead of night when I should be sleeping, I sometimes imagine the breath of the woman who not only gave me life, but delivered me from death. I sometimes reach into that tin by my stove, take a handful of berbere, sift it through my fingers and toss it into the pan…I have taught myself the recipes of my mother’s people, because those foods are for me, as a chef, the easiest connection to the mysteries of who my mother was. Samuelsson’s longing to know his missing mother is beautifully expressed here, and doesn’t in any way diminish his love for his adoptive parents. (Chapter 2 is called “My Swedish Mother.”) I think this chapter stands alone perfectly as an essay, and would be meaningful to many people who are not otherwise interested in memoirs of chefs. I found it very moving. My father died when I was nine and my brother was three years old. Losing my father was terrible for me, but at least I had memories. My brother grew up without any of his own memories of his father, just a profound sense of his absence — a different experience from the author’s but still the same profound longing to know someone who is beyond knowing. 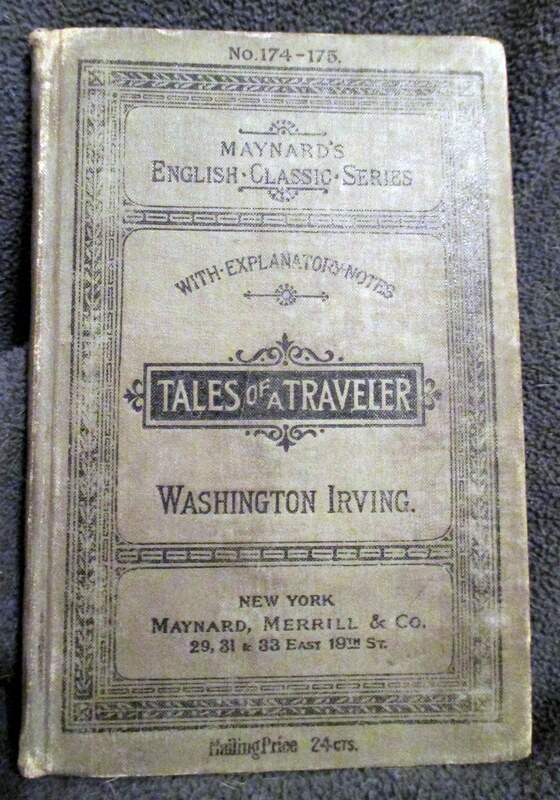 This little book is an old school edition of “A Traveler’s Tales” by Washington Irving. My father bought it used at the Dover Country Store in the 1950s, and it looked antique to us even then. My father neatly wrote the title and author on the spine in black ink. The book is in terrible shape, and I wouldn’t even try to read it, but it’s been part of our family library for more than fifty years and it’s not going anywhere. 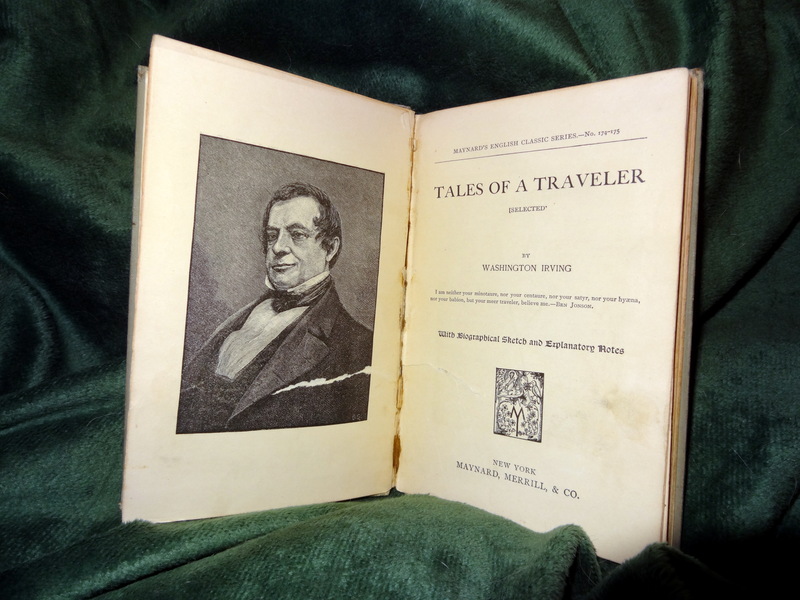 As a child, I was fascinated by this book because I loved the title, wondered where the traveler had been and what sort of tales he was telling. Just a few years after the launch of the Kindle, old fashioned books are making a comeback as authors promote the joy of bookshelves and well thumbed pages over the e-book. I found myself quite annoyed by this article on the comeback of old fashioned books. Philosopher Alain de Botton says he “dumped e-books when he realised the information didn’t really sink in without physical contact with a real book… I found that whatever I read on my Kindle I couldn’t really remember in the long term. It was as if I had never read it.” This may be true for him, but it’s certainly not my experience, or that of most other ebook readers, or we too would give them up. 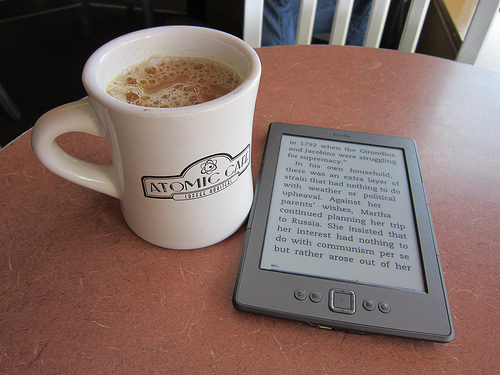 I find digital reading to be a better experience — when I was reading my first ebook on my first Kindle, I found it awkward for about the first fifty pages, and then suddenly everything just clicked. My thumb was turning the page effortlessly, and I had the strange and thrilling sensation that the author was sitting at a keyboard writing and the text was going directly into my mind. I can’t explain it better than that, it just felt so much smoother than holding a physical book. I now read for longer periods of time than I did with print, and I read more because I am never without a book and all waiting time has become reading time. I rarely buy or borrow print books anymore, but I see this as a matter of personal preference. I don’t like the implication that either the print or digital format is somehow superior for everyone. Author Jilly Cooper talks about how she missed being able to take notes in ebooks the way she does in print books: “I like to scribble all over [books] and write things and say ‘Well done’ and ‘God how awful’ and ‘Let’s remember that bit’. I always underline good bits and turn over the pages of bits that absolutely knock me out.” I think that writers are more likely to make this sort of notes than most readers. I was never much interested in taking notes in books. Writing in books always felt like defacement to me, even in my own books. (Possibly this is related to being a librarian.) I’ve always disliked finding notes (or worse, wavering lines of ugly yellow highlighter) in used books I’ve bought. But I do highlight text and make notes now using Kindle, and this meets my needs perfectly, since the highlighting and notes are attached to the text but I can see them or hide them as I am reading. As you can see, I get defensive when I read articles like this or hear people talking about the superiority of “real” books. But maybe that’s how other people feel when they hear people like me going on and on about the obvious (to me) superiority of ebooks. As toywithwords noted in the comments on this article: “…the words are the most important part of books, everything else is packaging. I still think of Achebe as “one of my favorite authors” but I must admit I can’t remember anything specific about any of the books. This happens to me a lot now — many books that I remember as my favorites have faded in my memory so I no longer remember them, and when I reread them, I often find they aren’t anything like what I remember. I’m sorry to hear of Chinua Achebe’s passing the way you regret the loss of a friend when you drifted apart years ago. Fortunately, I can reread his books to renew our acquaintance, and that’s just what I am going to do. I’ve always loved my father’s bookplate, neatly pasted into his favorite books, signed with a fountain pen and black ink. Our house was always filled with books of all kinds including lots of paperbacks, but there was something special about the quality hardcovers on the living room shelves that had my father’s bookplate inside. I used to take them off the shelf and open them just for the thrill of seeing the bookplate. (I still do.) They looked so official, like they had my father’s seal of approval. I have some of his books and I cherish them, and hope that they will eventually be passed down to father’s grandchildren and great grandchildren (and beyond.) But I thought I ought to photograph his bookplate just so that whatever happens to the books themselves, there will also be a digital image. I love this 1892 edition of Cranford, illustrated by Hugh Thomson. I remember pulling it off the shelf of a rare and used bookstore in downtown Salem, Massachusetts. I was just a year or two out of college and working at the Salem Public Library, and I frequently spend time browsing in the bookstore while waiting for the bus home after work. I forget exactly what the book cost — somewhere between $12, I believe, and although my then-husband and I were living on a tight budget, I had just cashed my paycheck and I impulsively bought the book. It was the time I ever bought a book that I thought of as rare rather than used, and I remember feeling guilty walking out with my purchase, but thrilled, too, thinking that I would have this book forever. There were two other books on the shelf from the same illustrated series, and I wanted those too, but I refrained, thinking perhaps I would try to save up and buy them over the next few months. I loved the new thought of myself as not just a book lover, but a collector. Later that week, the bookstore burned down. 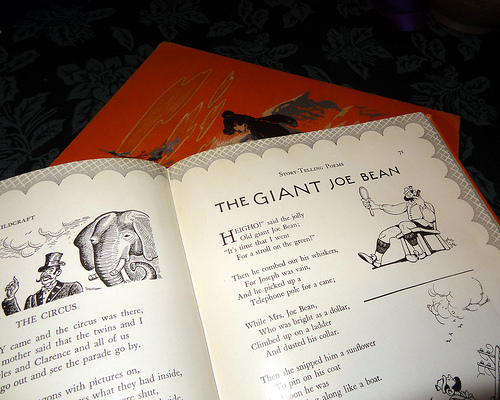 I never really became a book collector, but I still love this book. In 1933, the quiet, scholarly history professor William E. Dodd accepted his first (and last) diplomatic post and became the United States Ambassador to Germany. His wife Mattie, son Bill, Jr. and daughter Martha accompanied him to Berlin. Dodd and his wife were ill-suited for the diplomatic lifestyle, leaving dinner parties early to go home so Dodd could have stewed peaches and a glass of milk and retire early. Dodd was essentially an academic, unaccustomed to social and political wranglings his new post retired, but as a student of history he saw the true danger that Hitler and his followers posed earlier than most of his colleagues, including his friend President Roosevelt. His daughter Martha, meanwhile, threw herself into the social life of Berlin, made many friends and even more lovers, including a high-ranking Nazi official and a Soviet spy. It’s a fascinating story by a master of narrative nonfiction, but I found this book depressing and am relieved I finished it. It’s so hard to look at the actions of people in the early 1930s and not judge them too harshly with the wisdom of hindsight. I finished this book without much sympathy for any of the main characters. Martha was just awful. I rather liked her father for a while, but I lost all respect for him toward the end of the book when I read about his involvement in an automobile accident in his later years back in the United States. It’s a great book and I’m glad I read it, but I’m also glad I borrowed the ebook from the library instead of buying it. I’m done with those people and never want to reread the book, discuss it in a book group, see the movie, or have anything more to do with them. I just finished reading Comic-Con Strikes Again! by Douglas Wolk — although it really be would be more accurate to say I just started and finished reading it. It’s a Kindle Single, and it’s only the equivalent of 26 printed pages. It’s about Comic-Con International, an annual event held in San Diego that celebrates comics, graphic novels, science fiction, fantasy, anime, mango, video games and popular culture “transmedia’ properties like Star Wars, Twilight, etc. How interested am I in this subject? A little more than magazine-article interested, but quite a bit less than whole-book interested, so this Kindle Single was perfect for me. There isn’t much history here, or social, cultural or literary analysis. It’s really like following author Douglas Wolk around the convention and having him reminisce a bit and point out things that interest him. Wolk is the author of the Eisner Award-winning “Reading Comics: How Graphic Novels Work and What They Mean” and he’s an amiable guide. In July I spent a few days in Scotland traveling around some of the places where my mother’s parents once lived. I have memories and a collection of facts that I can fit together, but I want to know more, to have a better understanding of the family’s story. While I was there I picked up a copy of the UK bestselling memoir Guard a Silver Sixpence to read on the train. Felicity Davis tells her own story of life in a complex, dysfunctional Yorkshire family, suffering abuse from her grandmother while her mother and grandfather seemed unwilling or unable to help. The book alternates chapters between Felicity’s life, and the story of her grandmother’s parents and grandparents, which were much more interesting to me, and explain to some extent how her grandmother became such a cruel, hard woman. Felicity’s great great grandparents, John and Hannah Hinchcliffe, lived in Barnsley in Yorkshire, where John was a coal miner. 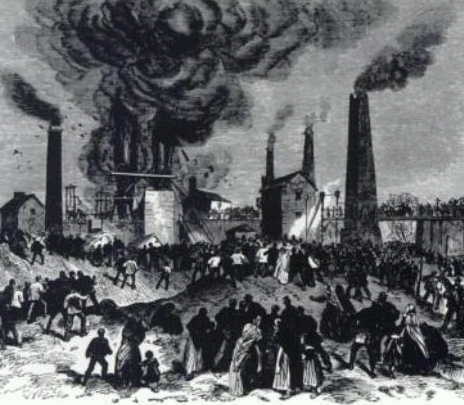 In December, 1866, two underground explosions rocked the Oaks Colliery and killed 361 men and boys, including the two of the Hinchcliffe’s sons, Henry and Charles. This event was both an emotional and economic disaster for the Hinchcliffes and whole community. John and Hannah were left and six other children, a son and two daughters who were old enough to work and help support the family, and three little children, including six year old Emily and a younger brother and sister. Little Emily, Felicity’s great grandmother, grew up in a respectable but poor family. She married William Swann, a glassblower with a drinking problem — glassblowing was apparently known as a thirsty trade. Emily and William both drank and had run-ins with the law, and the family sank into poverty and disgrace. At the age of 42, Emily and her lodger and apparent lover, John Gallagher were convicted of murdering William Swan after he had beaten Emily, and Emily and John were executed in a double hanging. Emily left behind eleven children, including four year old Elsie, who grew up to be Felicity’s grandmother. Felicity Davis was fortunate, in a way, that her family grandmother’s family history revolves around these two well-documented incidents, a notorious mine disaster and a sensational murder case. In both cases, she quotes extensively from contemporaneous sources, with heartbreaking details that bring the story to life. But what really interested me here is the social and economic history she shares. She doesn’t just tell us that the Hinchcliffes were miners and William Swann was a glassblower, she tells us what that meant at the time, both economically and socially, what the jobs were like, and how these occupations changed over time. Who was on their way up, and who was on their way down? How did families manage to make ends meet during hard times? Which young adults were able to marry and establish their own homes, and who needed to live at home, work, and help support their families? Many aspects of our lives are determined by the economic circumstances of the place and time where we’re born, come of age, and try to make a living and make a life for ourselves and our families. This is an area that I feel I have somewhat neglected in my own family history work, and this book made me want to learn more.